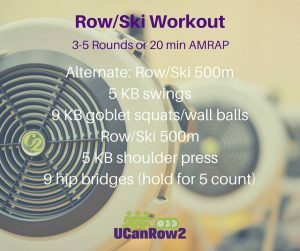 This workout is designed to be done alternating between the rowing machine and the SkiErg. If you don’t have access to a SkiErg you can row the whole workout. Or, if you want a bigger challenge, make it an all Ski Erg workout. If you do that aim for the lower number of rounds. When your indoor rowing workouts call for a larger number of meters, or you’re trying to hit a big number in the Concept2 online challenges, how do you keep it interesting? By breaking the workout up into smaller chunks and changing it up. 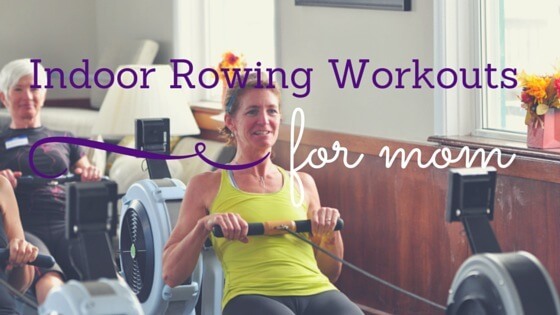 Longer indoor rowing workouts don’t have to be boring. You just need to have a plan that brings variety into the mix. Longer indoor rowing workouts don’t have to be boring. You just need to have a plan that brings variety into the mix. 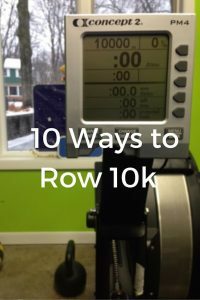 Below we’ve given you 10 ways to kill 10k in your indoor rowing workouts, plus one bonus workout. You’ve got options that will take you from an easy row all the way through, to a calorie-torching blast. It’s up to you, pick the plan that works for you based on how you feel that day. Do one round or put several of them together for a monster meter rowing workout. As always, if you’re new to indoor rowing get your doctor’s OK before taking on a rowing workout like these. Listen to your body and decide if it’s a good day for higher volume. 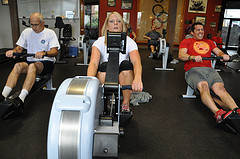 If you’d rather do something shorter, check our indoor rowing workouts pages for more choices. Get more workouts and rowing tips delivered to your inbox every week. Set the monitor and go: Find your happy place — that point where you’re sweating but you know you could keep up this pace for a long time, and row. Put on some good tunes and lean in to the Zen of the flywheel. Use this workout to find your steady-state target pace. You should be able to talk but prefer not to, and feel that you could stay at that pace for a long time. To easily set up the workout, from the main menu hit New Workout>Standard List>10000 meters. Steady–State With Power Bursts: Row 10,000 meters at the pace you found in the workout above. Drop in 10 or 20 hard strokes every 500 or 1000 meters. Aim to drop 10 seconds or more off your split every time you do the power strokes, but always return to your base, steady-state pace. Rolling 1000s: Warm up through the first 2-3000m, then row 100 meters hard, 100 meters easy for 1000m. Paddle for 1-2 minutes and repeat for 3-5k. This is also a great way to get used to harder effort on the rowing machine. Power Intervals: Like the rolling 1000s but longer intervals. For example 250 hard meters every 750 or 1000 meters. Negative Splits: Start out at a fairly easy pace and aim to drop your split per 500 meters every time over the course of the piece. Using the split window on your monitor, aim to drop it progressively over the course of the rowing workout. For example take 5 seconds off your warmup split every 2000 meters. Use the last 500-1000m as your cooldown. Stroke Play: Vary your strokes per minute (SPM): 2 minutes at 22-24-26-28 SPM, with the same amount of paddle rest, 2 minutes. Do this until you have completed the 10k. Bonus points if you can do rounds 18 and 20 spm (Hint: sloooow your recovery). Rolling Intervals: Row repeating cycles of 3 minutes at 22 strokes per minute, 2 mins at 25, 1 min at 28. Paddle in between if you need a break, or challenge yourself and keep on row-ling. Watch the Watch: Row rounds of 1:00 on with effort/1:00 off, 2:00 on/2:00 off and so on up to 5:00 on/5:00 off, then work your way back down. Increase your intensity as you come down the pyramid. Continue until you have completed the 10k. Vary the Intensity: Use this one to practice adding more intensity to your workouts. Row intervals of 4:00 on, 2:00 off, keeping your stroke rating the same (we suggest 24-26 spm) but varying your intensity through the 4-minute intervals, from sustainable to highly intense. BONUS ROW-SKI for those with access to a SkiErg. Use the undefined rest feature on your monitor to keep both machines going without having to reset. If you’re a complete badass (and in our book you are if you do this), switch the row and ski numbers so you ski more than you row. Which one did you try? Let us know what you thought in the comments, or if you have a question about endurance rowing, in general, let us know! 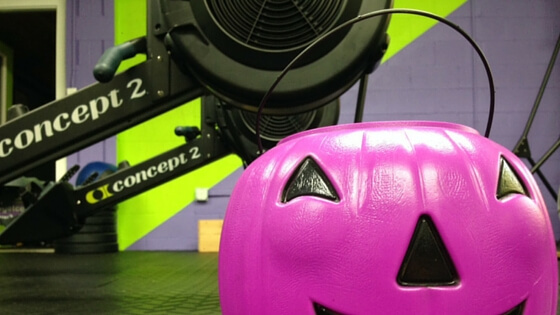 Candy-crazy season has begun, it’s time for a Halloween workout! You can’t walk into a grocery store without seeing row upon row of delicious-looking treats, all of them perfectly packaged with Halloween shapes and colors, and in tantalizingly small servings. Those fun-size Snickers bars and Reese’s pumpkins couldn’t have THAT many calories, could they? Well, not if you only eat one or two, but who does that?? We’re more likely to “parent-tax” the heck out of our children’s Halloween candy stashes, sneak two or three or four pieces every day, day after day, and before you know it we’re full-on into the Holidays and it’s Christmas candy calling your name. We’re not saying don’t eat the candy (ok maybe don’t eat ALL the candy), but a Halloween workout featuring candy that also makes us think first? We’re down for that! 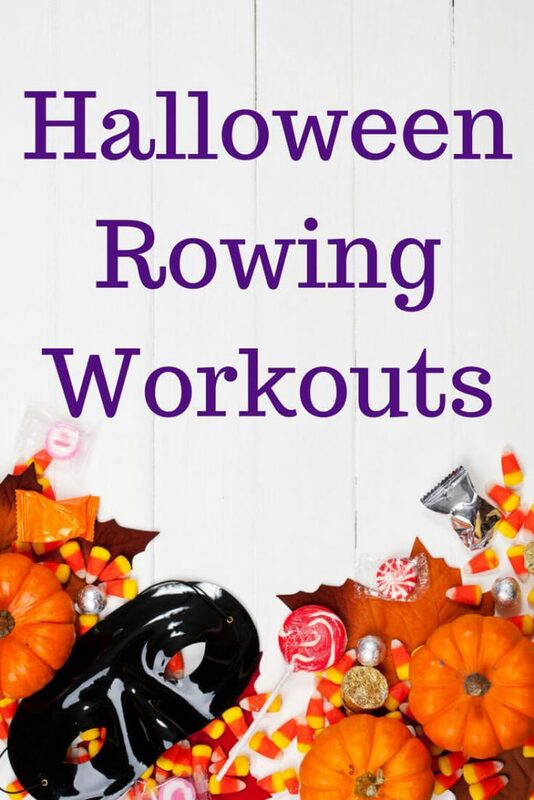 Below we offer two variations on candy-themed Halloween rowing workouts. One can be done as an individual rower or with a group, the other is a partner workout. Both will help you burn off a few fun-size bars, or fend off overconsumption with good reminders of how hard torching those calories really is. For both workouts you’re going to need some Halloween candy wrappers. Either use the wrappers themselves or tape them on a piece of paper. That way you can make multiple copies, particularly useful if you’re doing this with a group. Then you can cut the paper in strips and write the calorie count on each one. To help you plan and time the workout, know that a 10-second change in 500m split is equivalent to about 100 calories per hour: A 2:30 split is about 650 calories per hour, while a 2:10 split works out to about 850 calories per hour. A fun-size Snickers has 160 calories, so it will take about 15 minutes to burn at 2:30 and 11 minutes at 2:10. NOTE: As we’ve mentioned before, we don’t usually like to use calories to track our workouts. That’s because we don’t want our athletes thinking that the number they see on the screen is an exact reflection of the calories they’ve burned. We also don’t love focusing on calories as a measure of whether a workout has been done well. For athletes who want a more accurate read on how many calories they burn in their rowing workout, Concept2 has an online calorie counter you can use. Pick one or two pieces of “candy,” either choosing them blind or grabbing your favorites. Total the number of calories in each piece, then row to that amount on your monitor (press the “change units” button on the monitor until the screen shows calories). Repeat the above for 2-3 additional rounds if you want more work. Obviously you can vary the off-erg moves, too, depending on how much variety and challenge you want. Sounds fun, right? And it should certainly help people think carefully about how much candy they really want to tear into. Try the workouts and tell us how you did in the comments. Did you do them as prescribed, or make up your own variation? We’d love to hear, too, if you have another favorite Halloween workout. Need more SkiErg or indoor rowing workouts? Go here and grab our FREE #GetFlywheelFit workout set, or find a certified indoor rowing instructor in your area who can take you through an awesome rowing workout. Happy Halloween, don’t bite off more than you can chew! 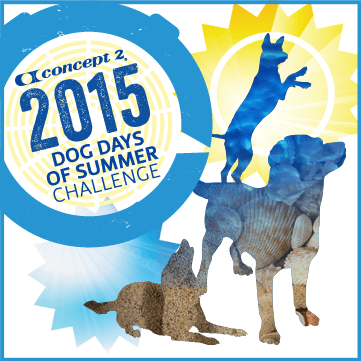 The Concept2 Dog Days of Summer Challenge has begun! This one starts out easily, with a goal of only 10,000 meters total skied or rowed in the whole week. Easy peasy compared to the 40,000-meter target you have to hit in the last week of the month. As with all of Concept2’s online challenges, it’s a good idea to have a strategy for how you’re going to approach the month. Intrepid rowers/skiers and long-distance/rowing endurance fans may like to hit the goal all at once. And really, why not try a marathon or half-marathon during the month if you’ve got a good base? This is also a challenge that lets you count your on-water or on-snow meters, so if that’s an option for you definitely take advantage … and send us pics! But if you’re a rowing instructor with classes to teach or you like more variety in your SkiErg and indoor rowing workouts, try splitting up the distance over several workouts. Here are a couple of sample workouts we’ve done at the UCanRow2 Bodyshop during the first week of the challenge. Obviously you can increase the distances or add more workouts to meet the goals of subsequent weeks. Let us know what you do, and we’ll share more of ours, too! What’s your challenge strategy or fave workout? Tell us in the comments, we’d love to share it with the world! What does mom want on Mother’s Day? Why, a Mother’s Day workout, of course! Marketers would have you think it’s flowers, candy, jewelry or breakfast in bed (Ok we agree on that one.). 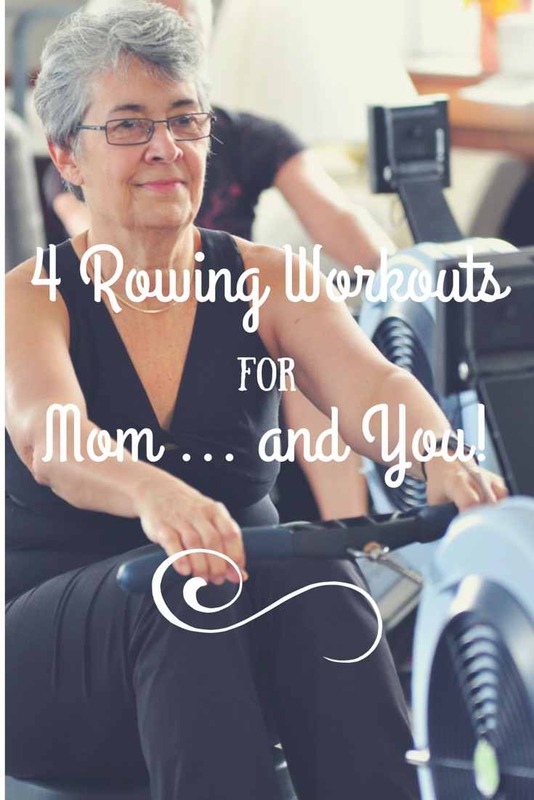 Our favorite way to celebrate mom is with an awesome indoor rowing workout. 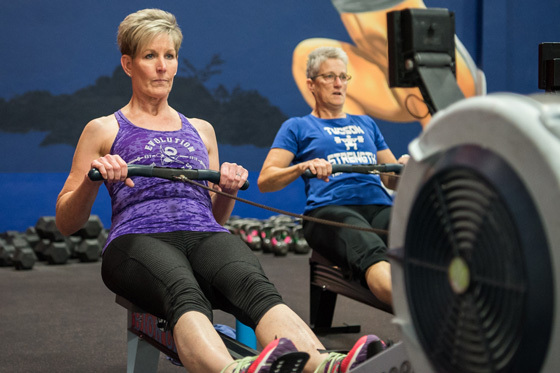 The rowing machine will give you a great workout, regardless of your age, fitness level, or ability. We’ve put three rowing workouts together for you here, but if you need more just head over to our workouts page. As a bonus we’ve added some SkiErg options, but if you don’t have access to one (Tragedy!) you can just row, no problem. 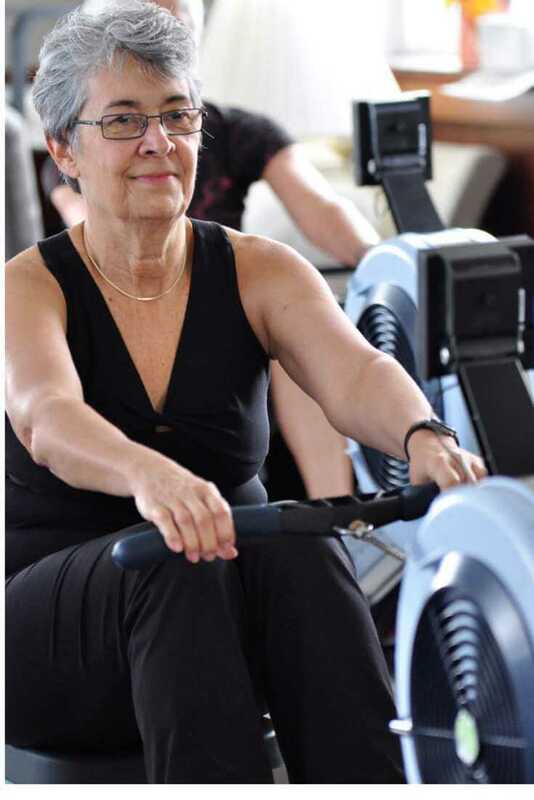 Indoor rowing classes are one of the best ways to work out – with your mom or anyone else! 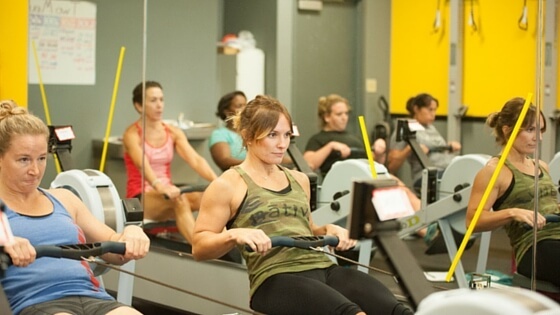 Unlike many other fitness activities (we’re talking to you, running…), rowing lets people of all fitness levels get their sweat on together, with nobody feeling left behind. Two people can be rowing right together at exactly the same strokes per minute. One of you may be covering more distance in that time but nobody needs to know. Ahhh, synchronicity. It’s a beautiful thing. 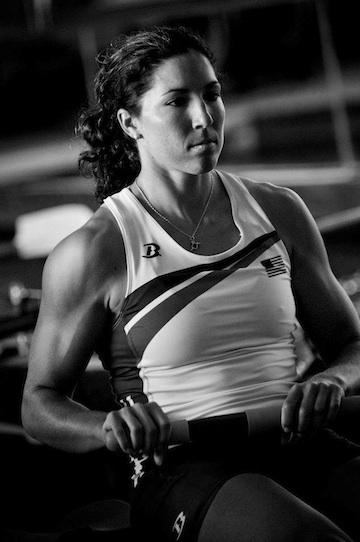 As we said, the cool thing about rowing is that pretty much anybody can do the same workout. That doesn’t mean, though, that everyone in rowing class can do the same workout the same way. Enter scaling. It’s what allows athletes of differing fitness levels to work out together, with everyone making progress and avoiding injury. We always stress in our rowing trainings that Rule Number 1 of being a fitness professional is Do No Harm. You want to set people up to succeed and feel good about what they’ve done – especially on Mother’s Day! So if your mom (or you) can’t do a regular pushup, no problem! Do them on your knees, or standing, against a wall. Is a full squat too much? Just go down as far as you can, or use a TRX strap or a chair for support. The main thing is to break a sweat, have fun, and then enjoy those recovery pancakes, waffles or a piece of chocolate! We’ve given you a bunch of options here. One thing to keep in mind though: If there’s a great variation in fitness in your indoor rowing class it’s better to do workouts for time vs. distance. Remember that mile run in school? Nobody wanted to come in last on that, and nobody wants to come in last on the rowing workout, either. One way to keep things running more or less evenly is by having people row for time instead of distance. We’ve had some fun with the date on this one and suggested 510-meter distances on a couple of the workouts (May 10th – 5-10. Get it? Haha.). You can just as easily make that a 2-minute row, though. People will get about the same number of meters. Try the Mother’s day workout! On all of these workouts, you should warm up well with at least 15 minutes of cardio. That could be rowing, running, walking, cycling, etc. Whatever you do, you want to have a good sweat going before you get into the heavier effort of the workout. For each of them you should use the undefined rest feature in your monitor if you have it. Warm up well, with 10-20 minutes of easy rowing or other cardio. Set your monitor for 1 minute of work and 1 minute of rest. Row rounds of 1 minute on, rotating with 1 minute of these exercises in any order you like: jump rope, push ups, power jacks, burpees, mountain climbers, sit ups, lunges, 20′ shuttle run, box jumps. No rest, just keep moving! Try them and tell us which one you did and how you liked it in the comments. Happy Mother’s Day! In high school, I was athletic but uncoordinated. Aggressive and powerful but clumsy by nature, I could run the basketball court all day but missed the majority of the shots I took. During soccer, the more nimble girls could easily place the ball in the top corner of the goal while I jumped out of the way as it came whizzing by. I started running and hitting the weight room. A strange combination, but they were simple tasks and I excelled. Repetition and power were my strong suit. As I shipped off to college, I sought out a sport that combined the repetition of running with the power of the weight room. When I tried out for the rowing team my freshman year, it was love at first sight. Eight years later, I made the Olympic rowing team and won a bronze medal with my three boat mates. No matter how much experience I gained in the sport, it was never easy – which is what makes rowing such an incredible, character-building exercise. There’s always a different technique to learn or a new twist on a workout to try. Whether you’ve been on the rowing machine for years or are giving it a shot for the first time, don’t be afraid to try something new. Here are a few rowing workout plans to get you started but before attempting, make sure you check with an instructor (preferably a certified instructor) on the correct rowing technique. This is a must! 1) 2×20 “steady state” at 20-22 strokes per minute, 5 minutes rest: While training with the national team, most of our time was spent building our base fitness. This involved a lot of long, steady workouts on the rowing machine. These types of workouts, while not “all out,” strengthen your core muscles and increase your fitness. Stay at a low stroke rate and focus on your technique and breathing. How hard should you go? Easy enough that you can talk to your workout buddy if you need to, but hard enough that you’re breathing heavy in between your words. If you’re not ready for a full 40-minute workout on the rower, no problem. Just work your way up by starting with 2×10 minutes or 2×15 minutes. 2) 1 minute on, 1 minute off x 15, at 26 strokes per minute: After warming up for 10-15 minutes, start off by doing the first 2 or 3 minutes at a 24, working up to a 26 by the fourth minute. The minute “on” should be at 80% of your maximum effort (so, make sure you’re not going 100% max effort). The purpose of this workout is to get comfortable with going harder without losing your technique. Feeling ready for a bigger challenge? Add on a second set of 15 minutes, after taking 5 minutes rest after the first set. 3) 4×1,500 meters, starting at a 24 and increasing 2 strokes per minute every 500 meters, 5 minutes rest: You’ve had a few steady state workouts under your belt, now you’re ready to bump that heart rate up! This one will do the trick. After a 10-15 minute warm-up, set the monitor for 1,500 meters and start out at 24 strokes per minute. When you cross the 1,000-meter mark, ease your stroke rating up to 26 strokes per minute. And as you come into the last 500 meters, give it another bump to 28. The key? Pacing and technique. As your stroke rating comes up – along with your heart rate – stay focused on maintaining your technique. Don’t forget to record your time so that you can monitor your progress next time! Remember, always keep an eye on your technique as you introduce harder and harder workouts. Challenge yourself to focus on what your body does, even as your heart rate climbs higher through the workout. Ready to row? Grab a friend and head down to the studio, boathouse or gym! Natalie Dell O’Brien is a former national team member and competed on the 2010, 2011 and 2012 USA Rowing Teams. She and her teammates won a bronze medal in the women’s quad sculls at the London 2012 Olympic Games. Happily retired from elite athletics, Natalie now lives in San Francisco with her husband Conor and is a public speaker and social marketing strategist in the tech industry in Silicon Valley. You can follower her on Twitter at NatalieDellOB. Try these, and then let us know your favorites. Got a favorite workout you’d like to share? Post it in the comments! Want more rowing workouts? We’ve got those too! And don’t miss Natalie’s Ted Talk about the value of losing. Great stuff! How do you get back on the rowing machine after a time off? Easing into it will allow you to do some rowing recovery. If you’re a regular reader you know that many of our indoor rower workouts involve getting on and off the Concept2 rowing machine or SkiErg. The idea is to give you a high-intensity workout that will build strength and burn as much fat as possible in the most efficient amount of time. As The New York Times has noted, intensity is a critical component of an effective workout. Not to mention lots of other benefits research has found from high-intensity training: reduced appetite, better stress management, possibly even a longer life span. And if it takes less time you’re more likely to be able to do it consistently, right? True, one would hope. But we all have times during the year where we can stray from an otherwise stellar fitness program. Vacation, the Holidays, a busy time at work, summer at home with the kids, can all move fitness to the back burner temporarily. Hey, it happens to the best of us! Just get back on the rowing machine as soon as you can and you’ll be back up to speed in no time. Read on for a couple of rowing recovery workouts that will help you get there. Before you even get back on the erg, take your fitness “temperature.” Have you put on a few pounds or feel like you’ve lost strength? How’s your energy? Are you raring to go or would you rather crawl back into bed? You’ll be able to tell in your first 10-15 minutes of an erg warmup if you’re going to be able to hit your rowing workout hard post-break (or any day, for that matter). Group rowing instructors, this is an important step for you to take every time your students come to class. Ask them how they’re feeling, and be ready to dial it back if need be. Maybe your energy and enthusiasm will be all they need to get through, but you need to also watch for signs that the intense workout you’d planned is too much today. If your students’ mood and energy level isn’t picking up as you go through your warmup, for example, that’s a dead giveaway that today’s not the day for high-intensity intervals. If you feel like the tortoise, start with a low-and-slow steady-state row. Keep it to 20-30 minutes and go at a conversational pace where you’re sweating but can keep up a conversation. 22-24 strokes per minute, no higher. Side bonus: Slow rowing is a great time to practice technique. Do rowing drills like the pick drill as part of your practice, or try rowing with your feet out of the straps. If you find you’re feeling good and want to go a little harder at the end go ahead, but consider this permission to be done. It’s OK if you’re not always in overdrive! Pat yourself on the back for having moved and get yourself revved up for the next workout. If you feel more like the hare, try the Holiday Recovery Row below. Longer, with more opportunities for effort, but still in the general mode of going lower and longer than you would in a high-intensity workout. NOTE: This workout assumes that you were able to row longer distances before your break. If the longest row you’ve ever done is 5000m, coming back from a break isn’t the time to try your first 10k, no matter how slow you go. Row for 20-30 minutes at a stroke rating no higher than 24 strokes per minute. Your goal is to stay at a conversational pace, where you’re sweating but can keep up a conversation the whole time. Throw in some rowing drills if you like. The pick drill, pause drill, and rowing with your feet out of the straps are all good choices for working your technique, but leave the sprint intervals and Power 10s for another day. Row, SkiErg or a combination for a total of 8000-10000m (24 spm on the row and a comfortable but challenging pace on the SkiErg). Add 10 hard strokes at 26 spm every four minutes. If you need help with any of this, find a certified indoor rowing instructor near you, or get in touch with us. Don’t see an instructor near you? Maybe it’s time for you to get certified, or take our certification course to ramp up your own rowing. Did you try one of these workouts? How did you do? Share your results – or questions about the workouts – in the comments. Want more workouts like this? Download our FREE workout set #GetFlywheelFit. 11 workouts you can do in 25 minutes or less. Chain Drive the UCanRow2 Newsletter is Here! Can’t get enough UCanRow2? Never fear, Chain Drive, the UCanRow2 newsletter is here! All things indoor rowing, delivered right to your email inbox. Workouts, playlists, technique tips, upcoming trainings, marketing advice, basically the best of the best of what we can find to help you get the most out of your erg or ergs, and be the best rower or rowing instructor you can be. We’ll start off on a quarterly schedule, and will move to a more frequent schedule if or when that seems like a good idea (We hate clogged inboxes as much as you do.). Got ideas of what we should include in Chain Drive, or a particular workout or playlist you love? We want that too! Leave a comment here or email info@ucanrow2.com. Of course, you can’t get the newsletter if you don’t sign up, so please subscribe to our newsletter. Is Using Calories to Track Your Workout a Good Bet? We often hear people say they go into the gym with a goal of burning X calories on the cardio equipment, be it on the treadmill, rowing machine, elliptical or in a CrossFit WOD. And we often tell them, that’s great, as long as you’re a 5’10”, 150-lb. man. If not, you’re probably getting inaccurate information. According to an article from the Huffington Post, research at San Francisco State University has (re)confirmed the unreliability of calorie monitors on exercise machines, and says they can be as far off as 25 percent. The story quotes Mark Gorelick, Ph.D., assistant professor of kinesiology at San Francisco State University says that if you’re desperate to know how many calories you’re burning in a workout you’re better off using one of the products you can wear on your body (like FitBit or Bodymedia Fit), which are more accurate because they use many more parameters to calculate your calorie burn than a cardio machine monitor. In our experience, though, wearable monitors are notoriously finicky about calculating calorie burn and effort in a cycling or indoor rowing workout, just as they are about calculating “steps” taken in a workout. Our advice, ignore the monitor on the machine and use the wearable monitor if it’s a motivator, but use the sweat on your shirt and the fit of your clothes to help you track your fitness progress – not the readout on any machine.